Hossein Derakhshan ist ein kluger Beobachter der digitalen "Permadisruption" des Medienmarktes. Carey observed that news is not just a product, but also a symbol and an identity-linked ritual akin to attending church: “a situation in which nothing new is learned but in which a particular view of the world is portrayed and confirmed. Journalismus als Kirche für den Intellekt? Na ja - ich zumindest habe mich durchaus ertappt gefühlt. News, both as a commodity and as a cultural invention, has also been affected by this process of deglobalization, as evidenced by our declining coverage of international news in our media. By 2010, the frequency and space of foreign coverage in four British newspapers and the number of foreign news stories in the United States had nearly halved over about three decades. Derakhshan beschreibt treffend, wie wir uns zu Tode amüsieren und immer angreifbarer für maßgeschneiderte Propaganda werden. 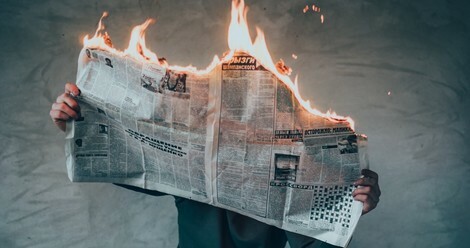 The biggest challenge for journalism is how to stay relevant to a democratic society even while its primary form — news — is disintegrating and while being buffeted by the twin forces of entertainment and propaganda. ...und vieles mehr. Keine leichte Kost und nicht gerade ein Motivationsseminar, aber unbedingt lesenswert! Thank you to everyone who brought this incredible movement for unbreaking news to life. We’re so proud to have done this with you!